Is Damage reduction included in the price? There is a single vehicle excess of $3800.00 which cannot be waived. When using a tipper (tip truck) There has also been an additional excess applied to the policy in relation to any claims which may occur during the action of tipping – Excess is doubled when tipping mechanism is engaged. Under 25 years of age there is an excess of $3800.00 which cannot be reduced. A surcharge applies from 21 years of age to 24 years of age is $12.00 per day for cars, $23.00 light commercials and $33.00 for trucks. We do not cater for learner drivers or “P” plate drivers. Yes, a driving licence needs to be produced at the collection of the vehicle. The licence will state what level of vehicle you will be allowed to hire. A normal car licence is sufficient for a 3 tonne or 4500kg GVM moving van. A LR licence is required for a 7900kg GVM moving van and an MR is required for a greater than 8000kg GVM moving van or tray top. A normal driving licence is sufficient for car, light van and utility or any vehicle up to 4500 kg GVM. Over head damage is damage to a vehicle over and above the height of the drivers head, thus going into a McDonald’s drive thru in a 3 tonne van will damage the van body and this is not insurable and the driver is liable for all costs of repairs. What happens when I dont look up or stop concentrating on my height? You also have the option of purchasing overhead damage cover for $80.00 per day with a $500.00 excess. On trucks the fuel is always diesel, it will be clearly marked on the fuel tank. All cars are petrol unleaded. The deposit is either paid in cash, credit card, EFTPOS or paypal, this is a security bond on the vehicle you are hiring. Why does the fuel gauge read half or quarter full? We dont have bowsers and prefer that you put in what you want to use, thus taking the truck with quarter of a tank please return with the same amount. If a cancellation is made up to 48 hours from your collection date (for a Saturday reservation) and 24 hours for every other day other than a Saturday a full refund is applicable. If a cancellation is made within 48 of your collection date (for a Saturday reservation) and 24 hours for every other day other than a Saturday you will be charged the full rental. Once your details are submitted we will contact you by phone or email to confirm your reservation. We ask for a credit card as a basis of securing your booking. Your credit card will not be processed or have funds deducted until you come in for vehicle collection. If you fail to turn up and it is within the guideline of 48 hour cancellation of a Saturday booking or 24 hours of every day other than Saturday then the dollar value as quoted to you will be deducted from your credit card. Our policy is to return confirmation of your booking either by phone or email as soon as possible. Is Cut Price on You Tube in a music clip? Are Hydraulic Lifters included in the price of moving vans? Can you take Trucks or Cars interstate? Yes you can take vehicles interstate, when making a booking enquiry let us know of your requirements and we will have the appropriate vehicle for you. GVM is gross vehicle mass of a particular vehicle. For the standard drivers licence the suitable truck has to be 4500kg GVM, anything that exceeds this 4500kg limit will require a different licence. All our standard drivers’ licence trucks are 4500kg GVM or lower. Yes, you can hire padlocks from $2.50 per day. If you lose a padlock replacement ones will cost $40.00. If you lose a key replacements will cost you $10.00 for each key. Use of the padlock is at your own discretion and there is no guarantee if the padlock is tampered with or if it is broken. All goods secured with the hired padlocks are the sole responsibility of the hirer. Can I smoke in the vehicles? No, we don’t promote smoking and if evidence of smoking exists you will incur a $100.00 penalty. 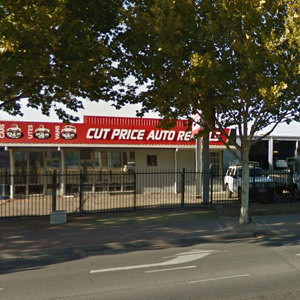 Disclaimer: Cut Price Car and Truck Rentals Pty Ltd and Cut Price Truck Rentals in Adelaide South Australia is NOT aligned in any manner with any interstate company of the same name. What’s the largest truck I can drive on a normal car licence?